I don't need to say this, but we've had a tumultuous several years in this world, haven't we? So many steps forward and so many steps backward, and it's hard to appreciate all the good in the midst of so much that is bad. Police brutality has been in the news all over the United States and recently, my beloved Chicago has (deservedly) gained national attention due to the practices of its police department. There is not a federal investigation into the police department and there have been many protests in the streets, people demanding the mayor to step down. Perhaps I have become very cynical lately, but I don't really see the point of protesting without very concrete demands; if you want the mayor to step down, then you should have someone ready to step up to the plate, take on the role. Otherwise, it feels incomplete and less compelling. This is happening all over America and probably the world. A lot of people are protesting and are 100% justified in protesting. But it's hard to understand what the next step will be. All of this really made me want to learn more about leaders for positive change. And, given the environment and the country I live in, Martin Luther King, Jr. seemed the obvious choice. The Autobiography of Martin Luther King, Jr. is not technically an autobiography in that MLK did not sit down to write his life story. But the book is comprised of his notes and letters and speeches and truly succeeds in bringing him to life. 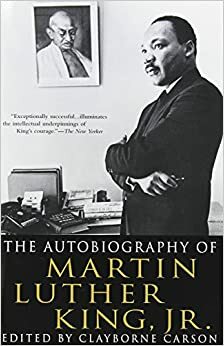 I highly recommend the audiobook version, which includes audio clips of MLK himself, so that you can truly understand what a charismatic and passionate speaker he was. It is impossible to read this book and not think about the current climate in America. So many things that MLK brought up and fought for are still issues today. Clearly, police brutality still exists. Schools are still highly segregated, even if they are not meant to be. There are still slums, still low-paying jobs, still a disproportionate economic impact of recession. In the book, Martin Luther King is quoted as saying that he never faced such racism and hatred anywhere in America as he faced in Chicago, and while I hope that's changed, I don't know that Chicago has done much to earn accolades. The city is still segregated, many people refuse to even drive through certain neighborhoods, and there are more victims of gun and gang violence here than probably anywhere else in the country. Most of those victims are black. Living through the most recent political and social movements in the world, from Occupy Wall Street to Arab Spring to all the other protest movements that ebb and flow, the success of Martin Luther King and the civil rights movement are even more striking. It is very difficult to make the status quo into an issue that people will care about, that they will fight for, that leaders will take notice of. I am truly amazed at what they were able to do. It is inspiring to read about and listen to and think about where we are now vs where we were then, and where we want to be in another fifty years to continue to progress and become the people, the society, the world that we want to be. This is an excellent read for anyone who wants to learn more about Martin Luther King and the civil rights movement. And for anyone who needs to believe that a small group of people can make great big changes in the world. Highly recommended. I've been reading Taylor Branch's trilogy on the Civil Rights movement, and it really is amazing how much they were up against and yet they were able to accomplish. Still, there is so much work still to do and I'm not sure what exact things I can do to help make change, other than donate to causes. I've had my Facebook activist moments, like I can't help myself sometimes, but I don't expect to make much change through that. I have been feeling terribly discouraged this week about solutions. Not just for things like police brutality but -- sort of everything? Gun control and mental health and all sorts of things, just every damn thing that's wrong with this country that makes me feel exhausted. I have gotten to the point where it feels like even the problems that seem simple are actually way complicated, and everybody is making a lot of noise and very little progress. But I know that's a cycle. Pretty soon I will cycle back out to a more optimistic place, I think. I hope. I am glad Obama made the executive action thing he did. It's the Tamir Rice thing getting to me, I think. I like to think I am tremendously hard-hearted and cycnial, but then I pay a bit more attention and notice that I have absolutely no defenses with stuff like this.